The usual view from the upper saloon windows at this time of year is one of swaying palm trees, azure blue waters and white beaches. However, this winter has been a little different, as we look out on to the old warehouse buildings surrounding Gloucester Docks. "Eye of the Wind" and our now hardened crew have spent the first winter in the UK since 1981. As you can all imagine, those frosty days before Christmas were a bit of a trial, but thanks to some appreciated care packages, silk longjohns and hot water bottles, we have managed to survive. In our last newsletter from the ship we informed you all that we were planning to sell the vessel, and try a spell of living ashore, to give Emma the opportunity to have friends of her own age, and a more formal education. Many of you took the opportunity to join us for what we all thought would be our last sailing season. On the completion of our round-the-world voyage, once again in Gloucester Docks, "Eye of the Wind" was inspected by representatives of the Australian sail training organisation seeking a replacement for the Melbourne based "Alma Doepel". Negotiations proceeded favourably for three months and it was planned that we would depart the UK in late September for a delivery voyage to Australia. In early September we were informed that the sale was off, as the Australian organisation would be purchasing the UK Sail Training Association (STA) schooner "Malcolm Miller". Subsequently, this sale also fell through. For those of you who had planned to do this Pacific voyage with us, we sincerely regret that we had to change our plans, but unfortunately it was beyond our control. Plan B was to go to the Caribbean for the Millennium celebrations. 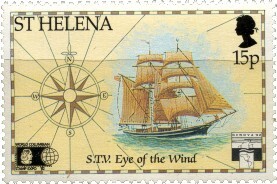 This was thwarted when we were informed by the Maritime Coastguard Agency (the newly formed agency regulating the operation of large motor and sailing vessels in the UK) that there was a new code of practice for sailing vessels over 24 metres, and our existing survey would no longer be valid come its expiry in early 2000. Consequently, this brought us once again to Gloucester Docks where we have gone about putting the ship into the new survey class. It has been a long and costly exercise, but we can now see the light at the end of the tunnel. We were extremely lucky to have the support of our existing crew and Fred, without whom we would never have been able to finish this mammoth task. As for the sale of the ship: - unfortunately, sailing ships are not on everybody's shopping list. There are a few possibilities in the pipeline, so we will be continuing to sail at least until the end of 2000. After an extremely enjoyable stay in Cape Town, South Africa, at the Waterfront Marina over Christmas and New Year, we departed on 3 January 1999 for the long passage to the tropical waters of the Caribbean. Fair winds gave us a good passage to St Helena where everyone enjoyed a couple of days exploring ashore and visiting the house where Napoleon was interned prior to his death on the island. The old 1927 Chevy bus is still in service, and provided a wonderful day out. A brief stay at Ascension Island allowed us to purchase some fuel from the "Maersk Ascension", which after 15 years as the floating fuel storage vessel for the island, is expected soon to be decommissioned. With stunsails flying, we headed northwest toward the Equator, and once again were accosted by King Neptune who initiated his new pollywogs. In apprehension of the event, several of the crew got in early and had a 'number one' cut with the electric razor to save Neptune the trouble. Flukey winds off the coast of Brazil caused us to arrive in Trinidad on the final night of "Carnival". Even though we lost the actual street atmosphere, at the weekend they had a post carnival show called "Champs in Concert", at which all the winning groups performed. There was an amazing cacophony as up to 100 drummers performed their steel band routines, and there were sequins and glitter galore as the winning costumes (some of them 20 feet high) paraded in front of the crowd. Some even had pyrotechnic devices secreted amidst their intricate costumes, and the crowds went wild with delight. Trinidad is the original home of the carnival concept, and the 'socca' songs (the beat is the same, with rhyming lines making social and political comment) and music they perform is a crucial part of their culture, even today. It goes back to the days of slavery, when this was their only means of protest against their owners. Meandering leisurely northward through the Windward and Leeward Islands, we took the opportunity that the exceptionally clear waters provided to dive and snorkel and see this area at its best. Everyone enjoyed the leisurely and ambient atmosphere of the Caribbean. Light wind caused us to set the iron topsail in order to make landfall at Bermuda. These same, unusual, conditions continued as a massive high streched from New Foundland to central Africa. Even so we arrived at Penzance on schedule, without really experiencing one gale during the entire crossing - we even had to unpack the shorts for a couple of days. Marine life was incredible, with whales and dolphins sighted every day in the plankton laden green waters. After the successful completion of the drydock in Gloucester, England in June, we spent some time exploring the south-west coast, the Scilly Isles, Guernsey and the Brittany coast before rendezvousing with the 1999 Cutty Sark Tall Ships' Race fleet in the picturesque French walled city of St Malo. The Shetland's own vessel, "Swan", provided a taste of what we could expect in Lerwick, as they entertained the crowds and crews with harp and fiddle music from the St Malo dockside. The Race started in spectacular fashion off the Breton coast with fair winds giving us a good passage to the separation zone of the Scillies. From here on, headwinds and light airs dogged the fleet, with the result that none of the large vessels finished the first racing leg to Greenock. The next Cruise-in-Company leg started with light airs, but then became a battle against strong north-easterlies, with the fleet battling to reach Lerwick in time for the celebrations. Leaving Lerwick for the second racing leg, southeast winds reaching gale force were to frustrate us on the passage to Aalborg in Denmark. The finish time had to be brought forward to salvage the event. A number of vessels were damaged in the rough conditions, and many of the trainees must have wondered what they were doing, dodging oilrigs and battling big swells and seasickness in an unfriendly North Sea. Returning from the Tall Ship's Race finish in Aalborg, we had a good sail at last, on our passage to Inverness, where we locked into the Caledonian Canal. The four-day passage was a scenic delight, although unfortunately, we were not able to sail down Loch Ness as we did last time in 1994. At least the unfavourable wind kept the legendary Scottish midges away! At Fort Augusta we were able to brush up our Scottish Highland culture at an extremely informative talk which covered many aspects of ancient Scottish Highland life. During our days in the canal the former Poet Laureate, John Porteous (assisted by his wife Helen) who had joined us in Aalborg, wrote an epic tale of our Caledonian Canal experiences. 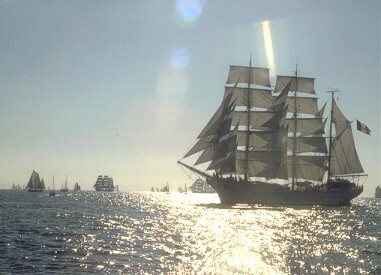 In early March 2000 we shall be under way again, sailing to Southampton to join the "Tall Ships 2000" fleet. This voyage will see us visiting Cadiz, Bermuda, the eastern states of America (including New York and Boston), and finally sailing from Halifax to Amsterdam in company with a spectacular collection of tall ships. Owing to the ISTA rules on the age limits for participants (15 to 25), we have accepted a charter from an organisation representing the Canadian Government to give young Canadians an opportunity to experience sail training for this five-month event. Whilst this is good news for the ship, it means we cannot have Emma aboard. The result is that she and Deb will be returning to Australia in early April in time to start Emma at school in Queensland. She has now been off the ship since September staying in Cornwall with Jenny's (our cook/deckhand) family, and has really enjoyed the experience, but still misses the ship (or so she says). We appologize for our lack of communication to many of you over the Festive Season, but at that point of time our plans were still unformed as we had not yet completed the MCA survey, and it was not very conductive to writing Christmas letters. We trust everyone had a pleasant and safe Christmas and Millenium celebrations.